The Defence Minister Smti Nirmala Sitharaman gave an in-principle approval for establishment of three Sainik Schools – one each in Tawang, Pasighat and Tirap-Changlang-Longding (TCL) belt. 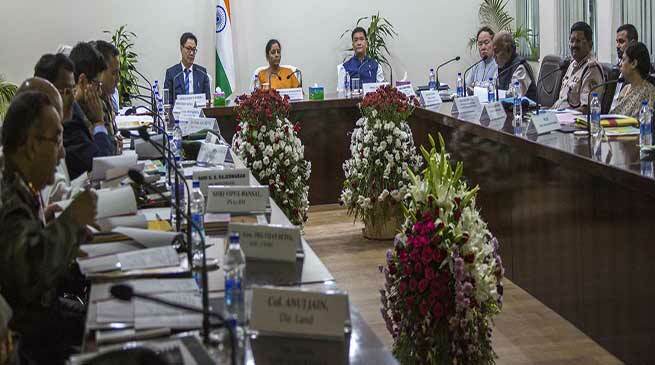 Union Defence Minister Smti Nirmala Sitharaman led a team of senior defence ministry officers including Secretary Defence, GoC-in-C (Eastern Command), GoC of Corp 3 and Corp 4, and other officers for a two day visit to Arunachal Pradesh. Today she had a high level meeting with Chief Minister Pema Khandu, which was also attended by MoS Home Kiren Rijjiju, Minister Land Management Nabam Rebia and senior state government officials headed by Chief Secretary Satya Gopal. Detailed deliberations were held on a whole gamut of issues in relation to land matters and other important issues of Arunachal Pradesh with Ministry of Defence. The Defence Minister gave an in-principle approval for establishment of three Sainik Schools – one each in Tawang, Pasighat and Tirap-Changlang-Longding (TCL) belt. The proposal for establishment of an airport at Dirang was also discussed and the armed forces evinced a strong interest in the proposal. The Defence Minister stated that this proposal will be given due consideration. The Chief Minister raised the urgent need to establish a cantonment in the capital area of Itanagar, for which necessary land would be acquired. Defence Minister assured the CM that this would be accorded high priority. It was decided that the Minister, Land Management will help in identification of a suitable contiguous land of 500 acres and immediately thereafter the defence ministry officials will undertake a joint survey and submit report to MoD. Khandu also raised the issue of need for expansion of land for Tawang township and urged the Defence Minister to consider freeing up some idle land in the vicinity of the township. She directed the GOC-in-C, Eastern Command to look into this matter favourably and submit a report urgently after consulting the district administration and govt officials. The Chief Minister impressed upon the need to expedite the opereationalisation of the Brigade headquarters in Tirap district so as to deal with the problem of insurgency in the region. Defence Minister assured the CM that the brigade headquarter would be made operational by December 2018. On the issue of strengthening the Balipara-Charduar-Tawang road, she assured the CM that this is a strategically important road and the BRO would be given clear directions for fast tracking its upgradation and all necessary funds would be provided for maintenance as well. She also informed the CM that the system of functioning of BRO has been completely restructured with greater autonomy and delegation of powers for faster implementation. The Defence Minister assured that the IAF infrastructural facilities in the ALGs shall be permitted for civilian use. She also assured that requisite funds shall be released for conducting survey for laying the strategic railway line from Missamari (Assam) to Tawang. Terming the visit as a “Landmark and Historic visit”, Khandu praised the Defence Minister for her “constructive approach and quick decision making abilities”. He further said that under her able leadership, the civil-military relationship which has been the cornerstone of Arunachal Pradesh society will get an even greater impetus. All the issues pertaining to land acquisition for defence purposes were deliberated in detail and sorted out. On the second leg of her visit, the Defence Minister will be visiting forward areas in the eastern part of the state. She has also accepted the invitation to revisit the state to lay the foundation for expansion of the National Institute of Mountaineering & Allied Sports (NIMAS) at Dirang in West Kameng district. Earlier on the day, the Defence Minister inaugurated the Buddha Mahotsav at Bomdila in West Kameng. Young and energetic CM having positive thoughts, endeavour and consistently approachability will definitely take the State up to higher levels in development in every aspect without doubt. Thanking honourable CM for his ability in persuing the Union Minister by approving 3 numbers of Sainik schools in Arunachal pradesh which is long fell desires of people. Let our CM & nirmala Madam be blessed with save and sound health.